When Patrick McMullan first heard in early 2017 that thousands of Swedish citizens were unlocking their car doors and turning on coffee machines with a wave of their palm, he wasn’t too impressed. Sure, the technology—a millimeters-long microchip equipped with near-field communication capabilities and lodged just under the skin—had a niche, cutting-edge appeal, but in practical terms, a fob or passcode would work just as well. The problem McMullan’s chips cleverly solve is relatively small-scale—but it’s still a problem, and any potential new use case represents a significant step forward for a chip evangelist like him. As with most technologies, the tipping point for implantable chips will come when they become so useful they’re hard to refuse. It could happen sooner than you think: In September 2017, Three Square Market launched an offshoot, Three Square Chip, that is developing the next generation of commercial microchip implants, with a slew of originative health features that could serve as the best argument yet that microchips’ benefits can outweigh our anxieties about them. Though new to the American workplace in this implantable form, radio frequency identification (RFID) technology has been around for decades, and has long been considered secure enough for commonplace use. RFID ear tags are used to register almost all farm and ranch livestock with the U.S. National Animal Identification System (in Australia, the system is mandatory). If you’ve checked luggage on a Delta Airlines flight, you can thank RFID luggage tags for the fact that your bag arrived at the same destination you did. And you probably already have a personal RFID chip that goes everywhere with you—it’s in your credit card. A decade later, floating throughout the eruptive hullabaloo around Three Square’s “chip party” were all kinds of fears—some credible, some less so—about the dangers of introducing subdermal radio technology to the American workplace: That companies might make widespread use of this technology mandatory, or that implanted microchips might be hacked or used to track wearers, or that hands might be severed in the name of home break-ins. Many critics, including state legislators working to pass bills that would restrict RFID implants, are fearful that the metal components and circuitry in the chips would mean certain death if a “wearer” were exposed to an MRI machine or defibrillator. Then there are broader fears about the use of chip technology to track humans: Before the damning research halted Verichip’s growth, the company’s chairman suggested in a 2006 appearance on “Fox & Friends” that Verichip implants could be used to register migrant workers at the border and verify their identities in the workplace; that same year, former Colombian President Álvaro Uribe reportedly proposed to then-senators Arlen Specter and Jeff Sessions that the chips could be implanted into Colombian workers before they entered the United States for seasonal work. 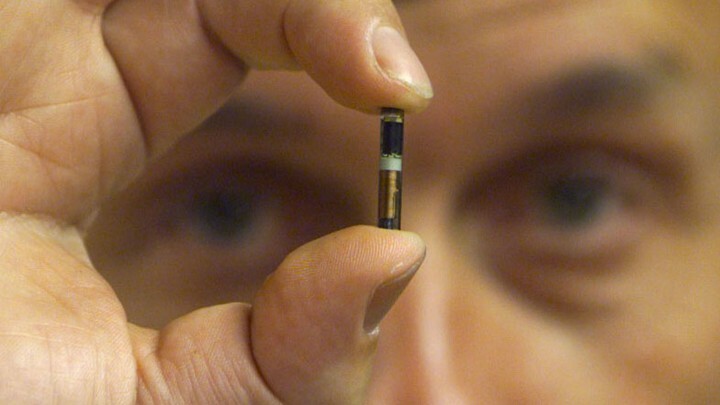 Meanwhile, some fundamentalist Christian communities remain convinced that the microchip implant is the manifestation of the biblically portended mark of the beast. But the primary challenge to RFID implants remains the simple underlying question posed over and over again in response to the tech: Is this really necessary? In 1998, British scientist Kevin Warwick (known by the moniker “Captain Cyborg”) became the first human to receive an RFID microchip implant. But since then, development has been slow. Kayla Heffernan, a researcher in the department of computing and information systems at the University of Melbourne’s School of Engineering, blames the fact that chipping hasn’t yet been accepted widely on what she sees as “a chicken-and-egg problem.” “People don’t get them because they’re not useful enough yet, but because there’s not a market the devices [remain] relatively unchanged,” says Heffernan. Nerve stimulators are among the many implantable technologies that have leapt onto the health-care market in full force. Insertable cardiac monitors like the Reveal LINQ have replaced sometimes-finicky stick-on patches as the most reliable option for patients with chronic heart conditions, and just two months ago, the FDA approved the first-ever long-term implantable continuous glucose-monitoring system for people with diabetes. Three Square Chip says that its medical RFID implants will be powered by body heat, and McMullan’s plans to develop a single piece of hardware to aid patients with a wider range of conditions could make the chips more affordable than devices with more specialized (and limited) functions. “Many heart patients, right now, the only time they know they’ve got a problem is when they’re in the back of an ambulance,” says McMullan. The company estimates that it will be selling chips capable of tracking a wearer’s live vital signs in a little over a year, but a few other developments will come first. McMullan hopes that people will soon consider storing their medical information on encrypted RFID chips, and the group is also working on a way to make GPS-enabled chips available as an option for families to track relatives suffering from severe dementia—another use for the chips that poses both obvious benefits and legitimate concerns. Yet for all of the implantable gadgets Americans use, and the heaps of location-enabled gizmos we own, the first commercial device with both of these features will be significant. A teenager who brings her iPhone to the school bathroom with her can one day choose not to. If visiting a physician to remove the chip in her hand requires similar parental permissions to other invasive medical procedures, well, then, we know how that episode of Black Mirror ends. The key to ensuring that RFID developments are used only as intended will be meaningful and active legislation developed to cut potential abuses off at the pass. In terms of workplace RFID implants, state legislatures are already behind. Before Three Square Market’s “chip party” last summer, five states, including Wisconsin, had RFID privacy laws preventing employer-mandated microchip implantation. Since then, only five more have introduced similar bills. But sooner or later, the laws will change, and the frightening will become familiar. After all, all it took in Sweden for RFID implants to become widespread and normalized was the simple appeal of never having to deal with a lost key. Whenever it happens, like waves of new tech before it, implantable RFID will bring us the next iteration of the yin-and-yang symptoms of technology we’ve seen time and time again. We will likely be healthier, safer, more informed, and more connected, and we will continue to disagree over whether or not it matters if our privacy and autonomy were the corresponding costs.